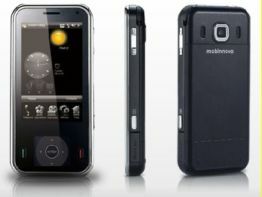 The Taiwan based mobile phone maker, Mobinnova has launched its newest Windows Mobile-based Smartphone, simply called as Mobinnova ICE. It runs on Microsoft Windows Mobile 6.1 Professional and powered with a 528 Mhz Qualcomm MSM7201ATM chipset. Additionally, it also features a 3 inch WQVGA with 400 X 240 resolution flat TFT-LCD touch-sensitive screen. Dimensions: 114 x 53.5 x 13mm. User Interface: mobiToday, mobiFeel and mobiShift controls. Networks: GSM850/900/1800/1900MHz & WCDMA/HSPA 900/1900/2100MHz HSDPA 7.2Mbps & HSUPA 2 Mbps. Display: 3 inch WQVGA flat TFT-LCD touch-sensitive screen. Memory: 256MB ROM / 128MB RAM and microSD expansion slot with SDCH support. Camera: 3 megapixel autofocus camera with dedicated shutter control and 2nd camera for video calling. Radio: Built in FM Radio with RDS/RBDS function. Operating System: Microsoft Windows Mobile® 6.1 professional. Connectivity: Bluetooth 2.0 with EDR / A2DP for use with Bluetooth stereo headsets mini USB 2.0 plus TV-Out CVBS + L/R audio. Battery: 1080mAh rechargeable Lithium-Polymer battery (Talk: Up to 6 hours, Standby: Up to 160 hours). Currently, the detail pricing and availability is yet to know.